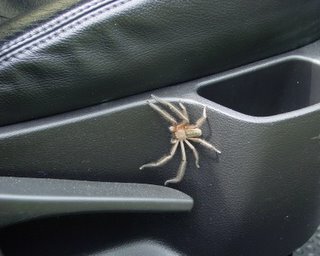 This morning I hopped into my car as normal, caught a sight of something brown in the corner of my eye, and hopped straight out again. This little fellow is a Huntsman spider. Big and ugly but not very dangerous. He was lurking in the little opening beside my chair when I got in. I just used a handkerchief to flick him out of the hole and then out of the car. Before I could suggest otherwise, Eric squished the spider. You can learn more about Huntsman spiders - if you dare - here. The house in which our friends live is on about an acre set within an area of over 200 acres on which sheep graze freely. 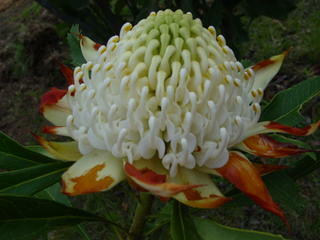 It is a beautiful part of the country, within sight of the Australian Capital Territory (A.C.T.) and Canberra. 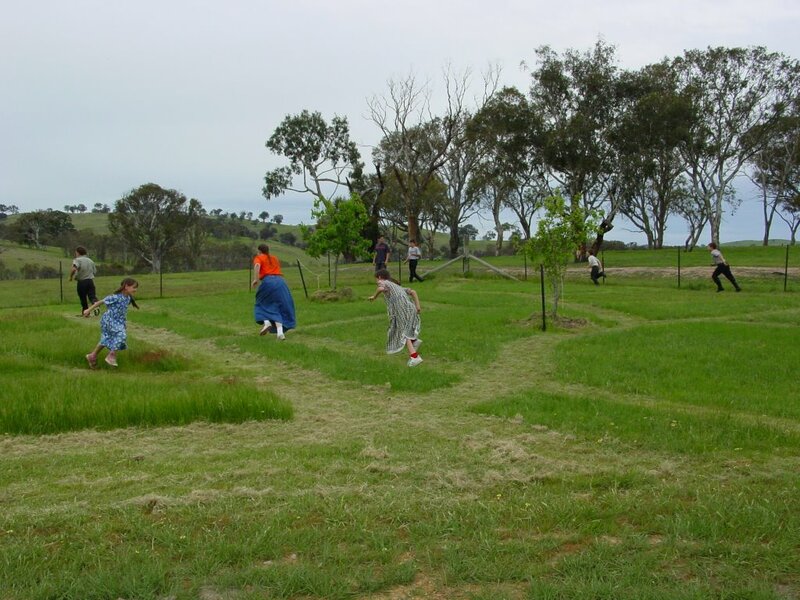 There is plenty of space to walk and explore and play. In this photo Eric and his friend wait patiently for Peter to eventually hit the shuttlecock in their game of badminton. Peter has made quite a few attempts already. 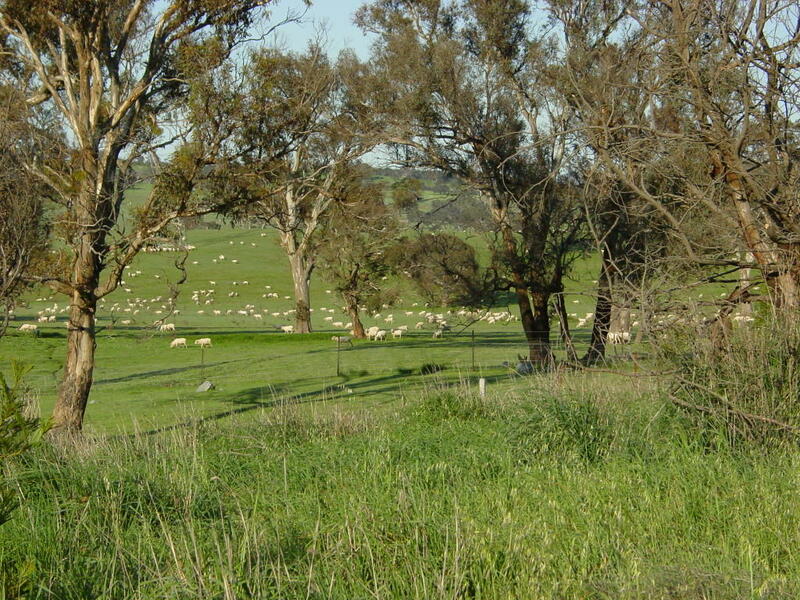 In the background you can see some of the sheep grazing peacefully. Today we visited homeschooling friends who live on a sheep farm. We sporadically exchanged letters over the last two years and were glad to be able to visit them once again. We all played a great game of Tag ["Tiggy"] in an area of the garden which was mowed in a sort of maze/pattern. One child started as "It" and had to tag the others. The players could only run in one direction and had to stay on the paths. As each child is tagged he joins forces until all players are tagged. The first one tagged becomes "It" for the next game. In this photo almost everyone is running! We have a section of our garden in which we can do the same. Often other people stare at us as we pile out of the car reminding them of the Keystone cops, or take more than one table at the restaurant or gather around one or two shopping trolleys. I enjoy the reaction and am always willing to follow the example of Frank Galbreth from Cheaper by the Dozen (the original book and film) and give a hearty smile and show off a little. From the time they begin to smile and react to you and for many, many years thereafter children are fun to be around. They look at the world in wonder and with a freshness adults often have lost. Children also do and say the most interesting things. We now record many of them in this blog because they are funny. Such as the things Clare says and does here and here, Rose here and here, James and Peter here, here, and here. As they get older you can do fun stuff together such as here and here. These examples are just from the last couple of months. With a number of children they can all be who they are and take turns being the center of attention. Internet communications are getting better all the time with MSN Messenger and Skype. MSN Messenger has the ability for text messaging, and if you have DSL/broadband also Video and Voice. I find MSN Messenger better for text messaging and Video communication. Skype is dedicated to very good voice communications with text messaging too. It can also be installed on Windows, Mac, Linux and Pocket PC. My clients are starting to use Skype as they can see when I am logged in, and if there is a problem it is a quick matter of either typing a message or calling via Skype. All at no cost! It doesn't matter if it is Lana's parents in their house next door or my clients in the US or distant parts of Australia. Whilst we were in the US we used Skype to call Lana's sister in Canberra and I used it to communicate with clients in the US and Australia. Email me if you want our Skype/MSN details. Today makes it a month since we landed at Sydney airport. What a busy time we have had! After being away for two years it's amazing how many things need to be restarted, but it is also surprising how smoothly it can be done. Even though we were many thousands of miles away in another country, the power of the internet and modern communications meant we remained in touch with family, friends and clients as if we were only a short distance away. One method was this blog and the monthly newsletter which preceded it. The other was the Internet. I was able to keep on top of the majority of my Australian banking and bills via the Internet. And lots of little things. But it is all worth it. We had a great time in the US, made many good friends, experienced many enjoyable events and have developed a definite love for many Americans - yet home is still home. Tasting familiar foods, seeing familiar sights, hearing the local bird and insect life and seeing a different night sky - a thousand little things have meant we quickly settled in. Still - we feel truly privileged to have had the opportunity to a part of American life and have many things to share now we are here. Today we had an appointment to join my parents for lunch at McDonalds in Mittagong. The children enjoyed getting their choice from the menu - including desserts - and to play in the playground. Afterwards we popped into "All Aboard Braemer Model Railways". This is a store run by model railway enthusiasts which includes a number of very detailed working displays, a coffee shop and hobby supplies. Eric wanted to visit for some scenery supplies for his Lord of the Rings wargaming. As part of the fee to explore the railway displays ($10 a family) the children could do a spotting game. There is a series of about six different sheets with pictures of items to spot amongst the displays. This had all the children peering carefully into each display looking for a sheep, dinosaur, haunted house and lots more. This photo is of Eric just finishing off one of his sheets. Chairs are available so the smaller children can get higher to look further into the displays. One of the news-groups of which I am a member started this stitch-along. The designer is a lady from Germany who hosts a message board called linabear.com. 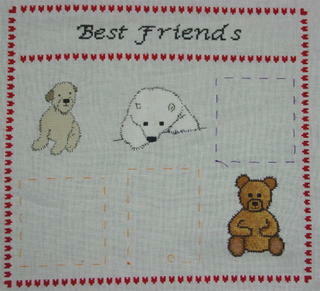 Members get to receive the pattern and also post messages. Cross stitchers from around the world eagerly await each part so they can all stitch the same pattern together. 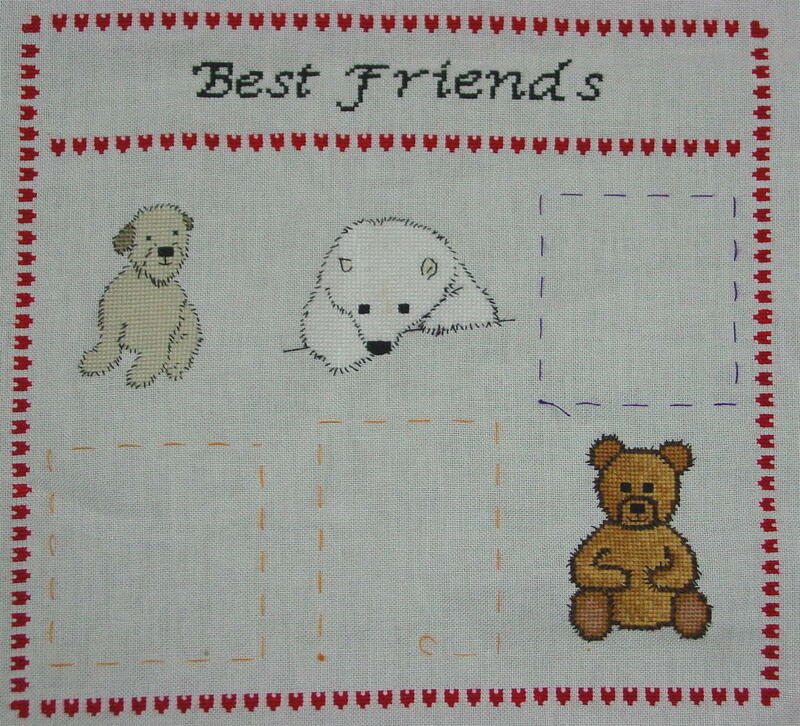 This is the pattern after four parts - the border first with the locations of each future pattern, then each "friend". I am not sure what is next (other than bears and dogs). I may add some balloons or flowers or something in the gaps once I have finished all the parts. There is no cost to the stitch along but it is good fun knowing that I am doing the same pattern as ladies from Germany, Finland, UK, USA and others. Every Saturday evening for as long as I can remember, my parents have always sat down at the table and "done the books". When we were younger they closed the doors separating the kitchen from the loungeroom and whilst we watched TV, Dad sorted out his income for the week and allocated it to his various accounts - regular expenses, emergency fund, Christmas club, mortgage, etc. This regular habit allowed them to control their finances and have relative peace of mind. As both were involved "doing the books", both knew where they stood financially. Dad's current simple method of handling his finances is to gather his main bills and multiply them to get an annual amount and then he adds 10%. This is then divided into 52 weeks so he knows how much to put aside each week. If all goes well, there is enough excess in the calculations to end up with a bonus each year in his expenses budget. - cover all your expenses, repayments and savings before spending on "wants". Pretty straight forward and simple to remember - I just add in Quicken to do the recording and reporting. Update: Hello everyone from 4 Real Learning Forum! There are more finance and homeschool posts linked at the side. Fell free to visit often. If you are ever trying to call someone in the Australian bush you will need to master the call of "Cooee". This is a high pitched call which carries far through the bush. Some history of it is here. Start low with the "Coo" and the go high with the "ee" aiming for the echo. My parents are currently visiting and getting to meet all these children that have grown so much since they last saw us almost three years ago. They arrived at the back of our property and all the children were inside doing schoolwork. So my dad called "Cooee" to get the children's attention. A common use of the term is when something is a long way off, it isn't "within cooee". I sometimes use it when reconciling account balances and describe unbalanced items as "not within cooee". 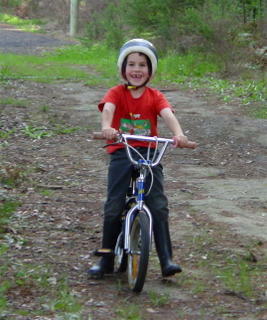 We keep explaining to the children that there is an easy way and a hard way to learn safety when riding their bicycles. 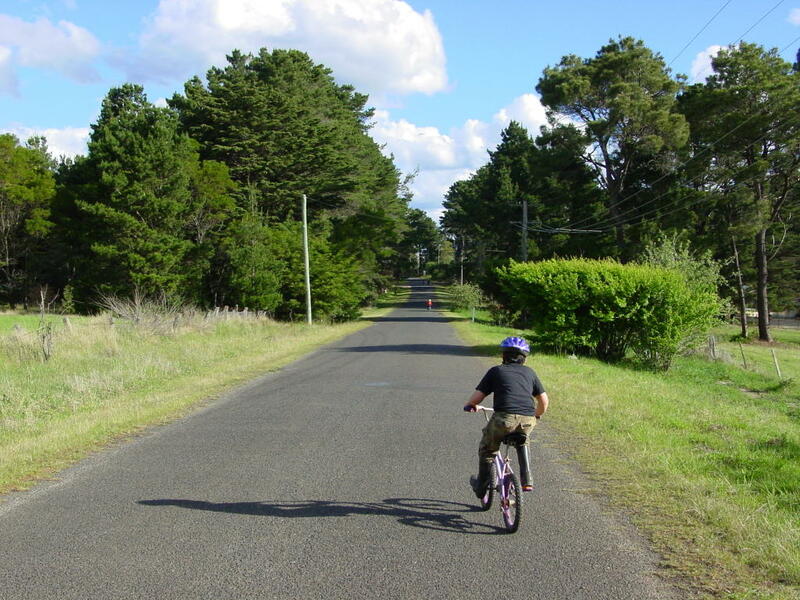 The easy way is to listen to instructions and consider the possibile dangers when riding and use the brakes. I am pretty sure that they want to try the hard way first. 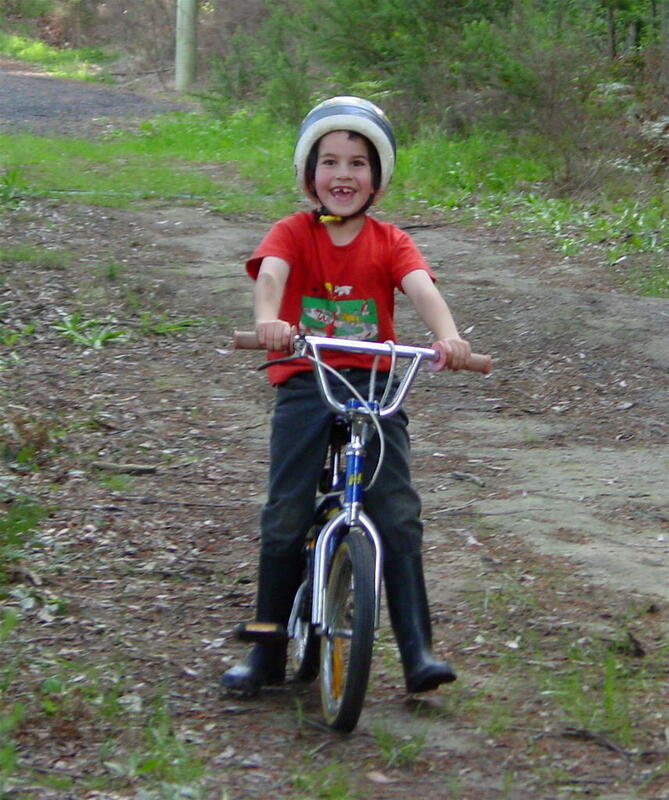 Look at this picture of Peter riding his bike. Note how his feet are placed. NOT on the hand brakes. How will he stop, you may well ask? By colliding with the nearest available obstacle or just fall over. There is a nice smear of dirt on his right arm from when he fell spread eagled on the ground about five minutes before this photo. Just behind him is a dirt track with a large bump which the children like to ride fast and jump over. He rode fast, jumped over and then crashed. Our hearts skipped a beat as he got up laughing saying, "Did you see how fast I went?! I was in the air over the bump!" I think Peter has chosen the hard way to learn. Update: Ariel and Eric have both informed me that the reason his hands aren't on the hand brakes is because his hands don't stretch far enough. But that doesn't explain his feet! Our local village is graced with one retail establishment - The General Store. 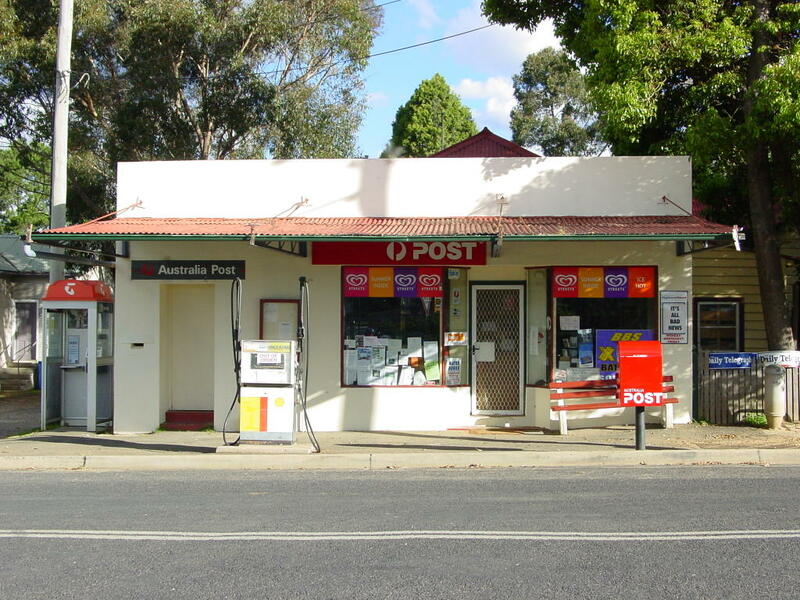 It is also the post office, a branch office for one of the banks, video lending library, agent for most of the public utilities and sells the basics and lots of useful bits and pieces. The mail is delivered here and then sorted into the relevant alphabet pigeon holes ready for the locals to drop in. Lana and her parents drop in during their morning walk and not only receive any mail, but also catch up what is happening of interest to the village. The couple that run the store have lived in the village for many years and are a great example of Australian hospitality. When I popped in to pick up some mail, I was welcomed back with a hearty handshake and "G'day David. Good ta see ya back, mate!" As you can see, the front windows are almost completely filled with notices for anything from the train timetable, local offers of employment, notices from the fire brigade and school events. The red box at the front is the post office box. 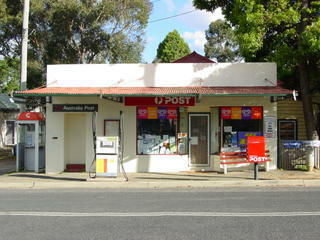 All mail is either handed in at the store when it is open, or posted in the post box. Even where deliveries are made, postal employees do NOT pick up mail left in your own mailbox. They just deliver the mail Monday to Friday. In the US the postal workers pick up mail left in your own mail box and deliver Monday to Saturday. Whilst my computer was busy upgrading some client data, we all went for a walk around our village and surrouding streets. This photo is a typical view. The older children always like to ride now that we are on relatively level land, while Lana and I walk with Clare and Rose in her pram. It was a pleasure to wander around exploring our home with new eyes and thinking how it is different from our previous home of over two years. We are about two hours out of Sydney and I think it is worth the travelling. As they are not always around, Ike wants company and our place is able to provide lots of company! He arrives here around 8:00am waiting for Lana's parents to awaken so he can accompany them on their morning walk. Now that the children are here, he gets to join them too! He will take as much petting as you can give him. 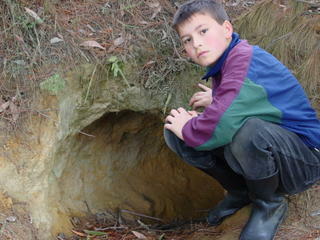 Here he is assisting us find wombat holes. He is the dog you have when you don't have a dog. That is why we call him our Claytons dog. The term "Claytons" is derived from an advertising campaign many years ago for a brand of a non-alcoholic drink. The advertisements basically said this is the drink you can have when you're not having a drink. Pretty quickly this became part of Australian language to describe anything that wasn't really what it purported to be. Such as little mobile hut serving hot food as a claytons restaurant, a large family van as a claytons school bus, and so on. Here is an example from a news report re a "claytons" marine park, a business providing a virtual secretary, even a government minister criticising an opposition policy as a claytons policy. The Waratah is the state flower of New South Wales. The normal colour is red, but in rare parts of the country white ones can be found. Lana was able to capture photos of both in her local walk. They are growing in yards of the locals. The flowers are quite different to anything normally seen in the US or Europe and it is no wonder it became the state emblem. 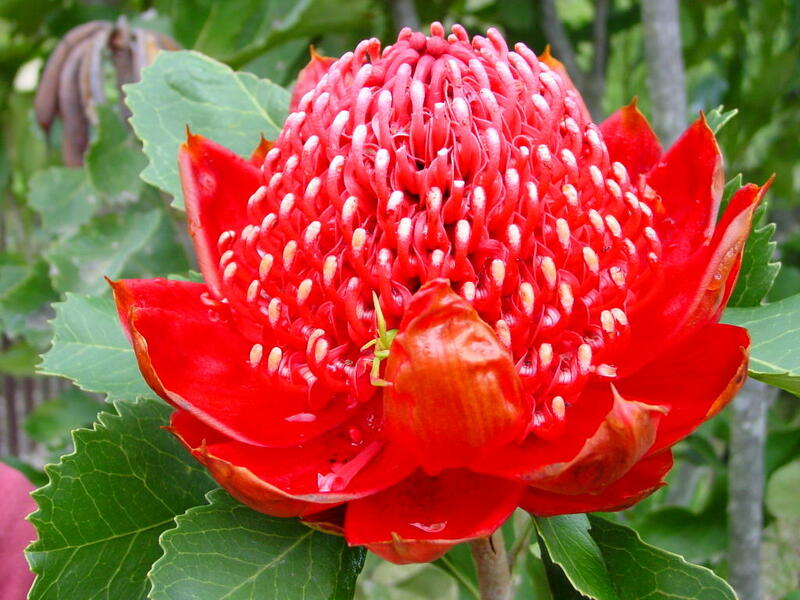 More information about the Waratah and "How the White Waratah became Red"
Whilst I have been out and about helping my clients, Lana has restarted her daily walks. 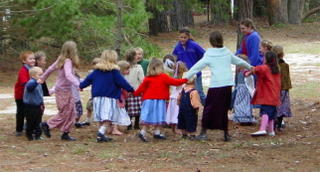 The children like to come along and make it into a "nature walk". So Lana goes for a walk with her parents early in the day, and then they all go for a walk or bike ride later. Today they had a good look at some wombat holes. These holes were in the side of a local road. If you look closely you can see the scratch marks in the sand stone the Wombat has made to burrow into the ground. Wombats are not noted for their dazzling intellect. They are often seen dead on the side of the road, normally because they have been a bit daft. A common nickname for wombats is "Mobile roadblock". Wombats like to wander into the middle of the road after it is dark. When the car stops and waits for it to cross, the wombat will look at the car, consider which way to cross, start in one direction and then just as the car starts to move, quickly dash back the other way in a fine attempt at getting underneath the vehicle. 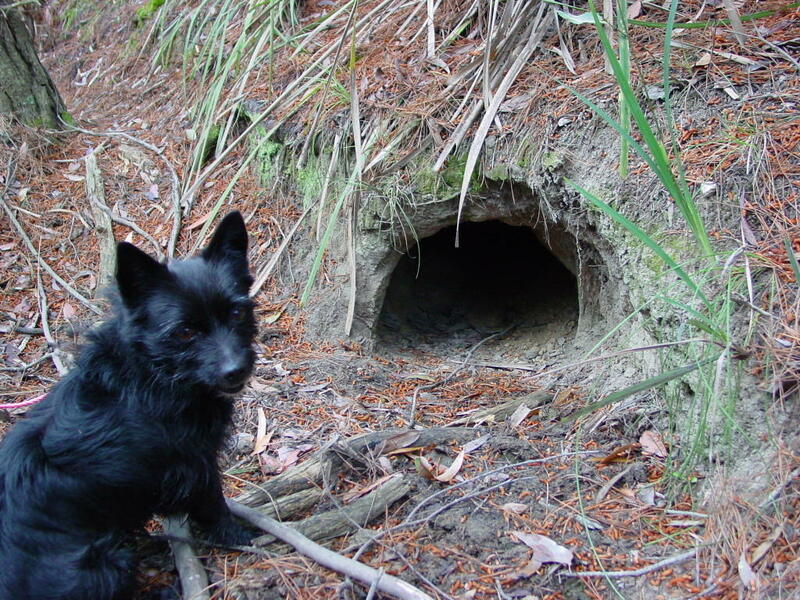 Also, many an old house has a collapsed corner due to wombats burrowing under the edge of the house with the weight of the structure collapsing the hole. Ariel has just finished reading the book "The Apple Dumpling Gang" by Jack M. Bickham. This appears to be the book the Walt Disney film is based on, although most of the movie differed from the book. I thought the book was really good. First you find out that this guy, John Wintle, is going to the sheriff's office wanting the sheriff, Adam Bricker, to do something for him. He asks the sheriff, "Will you be able to pick up some valuables coming on the coach tomorrow?" The sheriff asks "What type of valuables?" John Wintle answers "personal valuables." The sheriff agrees but wanted to know where Wintle was going. Wintle said San Francisco. Tonight. In about 30 minutes. The sheriff then writes a note to remind himself to go to the coach and sticks it on the moose's antler. The local editor has been writing about the sheriff, saying he is too old, and gangs are out of control and generally being a nuisance. The next day the sheriff goes to pick up the valuables and there are five children waiting for him. So the differences to the movie start piling up. The hero is the sheriff (not a gambler), there are five children from an 18 year old girl down to a 3 year old girl. 2. Clovis kicks people in the shins if you touch him. 3. The Hash Knife gang - Theodore and Amos - just as incompetent as the movie characters. 4. There is a Stillwell gang. There is no gold mine, no forced marriage (the children encouraged the sheriff to propose to his long time love), no fighting over the children and too many things to mention. Overall the book is VERY different to the movie and much more enjoyable than the movie. It is worth tracking down. Today we had a delightful afternoon with the local homeschool group. Our group of families meets the Third Sunday each month and involves Mass at 11:00am followed by no planned activities until 1:30pm when we have some devotions in the Church for about 30 minutes, then more socialising. As each family has, on average, about six children there are a lot of people with which to interact. The farmer in the dell, The farmer in the dell, Hi Ho the dairy-o, The farmer in the Dell. The farmer chooses a wife, the farmer chooses a wife, Hi Ho the dairy-o, the farmer chooses a wife. Then the "farmer" chooses one of the circling children to be his "wife". The children then sing, "The wife wants a child...", the "wife" then picking a child, then "The child wants a dog" and "The dog wants a cat" and "the Cat wants a mouse" and "The mouse wants some cheese." and "The cheese starts to dance..."
This is the end and the "Cheese" is the farmer in the next round. Good fun all round. As you can see there are children of all ages playing - even a three year old boy standing in the middle watching all those around him in amusement. DSL/Broadband arrived in our little village a few months ago. When we returned to our home we only had dial up and one phone line. This was a huge change after living with DSL in the US. Whenever we wanted to go online and check email and update the blog or research questions the phone line became busy. Also downloading files was quite painful. Now we are back with great broadband allowing us to access the outside world with the speed to which we have become accustomed. The word has passed around. Our house feeds birds! 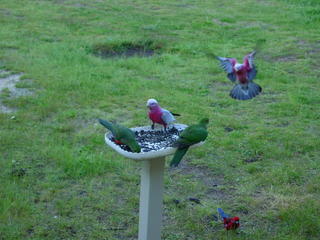 In this photo you can see the King Parrots, a Crimson Rosella on the ground and Pink and Grey Gallahs on the feeder and in the air. Lana's dad made the feeder from excess timber left over from our deck and the base of an old washing basket. The grooves left over by the basket sides make a great perch for the birds. Some of the birds are quite cheeky. They even wander into the house demanding their breakfast! Still, feeding them from the hand is an acquired skill. After seeing Ariel and Eric feeding them with seed in their hands Lana though she could give it a go. The female king parrot (green head) immediately bit her finger. Lana MIGHT try it again, but certainly a bit slower. Apparently the biting is training by the bird of the person to get the hand a bit closer. It is a small tough drought and heat resistant tree from the Middle East. As you can see it has masses of pink pea flowers in spring. 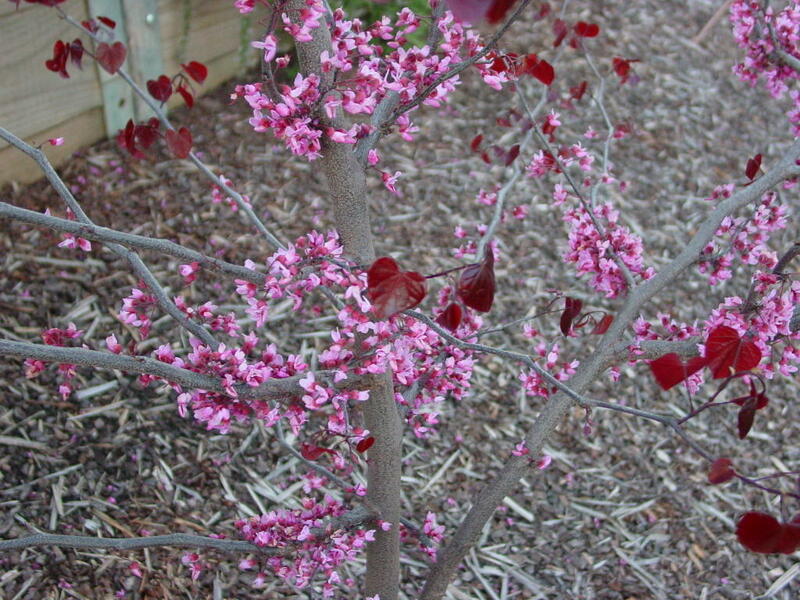 It is named "Judas Tree" as it is supposed have been in the garden of Gethsemene when Judas betrayed Jesus. 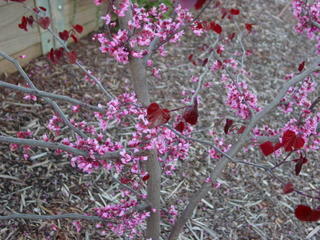 Also, note the leaf shape: A crimson heart. Being drought and fire resistant this will be a great tree to plant around here. Sheep are a huge part of the Australian economy and diet. In the part of the US where we lived (Georgia) lamb was uncommon. The main meats were Beef, Pork, Turkey and Chicken. Here the main meat types are Beef, Lamb, Pork and Chicken. Kangaroo is pretty rare! The land looks very green and first glances indicate that all is well. However those on the land have mentioned that all the green doesn't reflect growth. The grass isn't dense or tall enough to provide much feed for the sheep and cattle - but it is a lot better than brown!. Hopefully the rainfall will continue. Also, notice the colour of the gum trees. The typical colour of trees in the US in Spring is vibrant bright green. Gum trees (Eucalyptus trees) have blue green leaves which remain all year. Throughout the year the trees drop dead leaves, twigs and branches depending on water supply. This builds up a great wealth of kindling ready for the Summer bushfire season. I have just been away assisting a client in lovely Tumut. 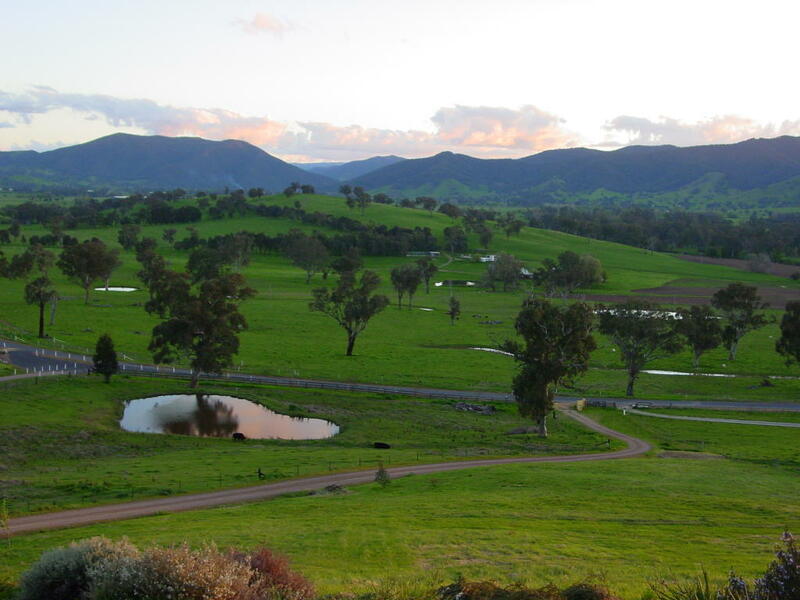 Tumut is in the edge of the Snowy Mountains and is a beautiful part of the world. 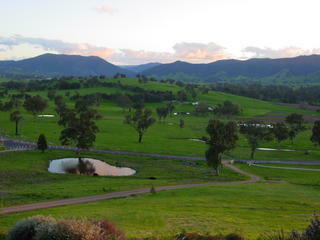 This photo is the evening view from the lounge room of the house in which I was staying. There has been some rain lately which has greened up the whole landscape and making everything feel like new again. The pond down below is reflecting the setting sky, with pink tinged clouds. Yesterday after Mass we visited family friends. There were five families there which meant ten adults and 31 children ranging in age from one to eighteen years of age. We had tasty barbecued sausages and steak for lunch and a variety of desserts for afters. Many of the desserts were from the children's entries into the local agricultural show. The local shows have competitions for livestock and plants and other "agriculural" things, but the pavilion has a plethora of entries covering cooking, crafts and almost anything anyone makes. A number of the children had entered cakes and artwork winning a variety of prizes. Prizes were typically a ribbon or certificate and a token cash prize of a couple of dollars. Mind you, the children get pretty excited to get such tokens! 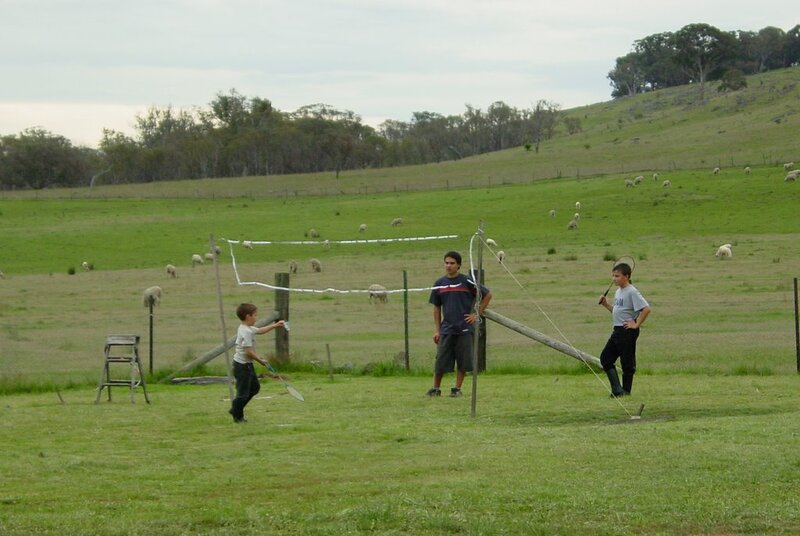 Whilst the adults chatted on any topic, ranging from politics, religion and the meaning of life and even controversial topics like football and cricket, the children all went their merry ways. This type of day is always very laid back and extremely enjoyable. We ended the visit with all the families joining in prayers and then departing into the night. The children are very excited to be in a larger vehicle. Our friend purchased a Ford Transit van containing 12 seats for us ready for our return so we all have a chair with some seats to spare. 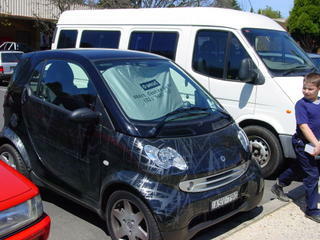 Last weekend we went shopping and parked next to a REALLY SMALL car. 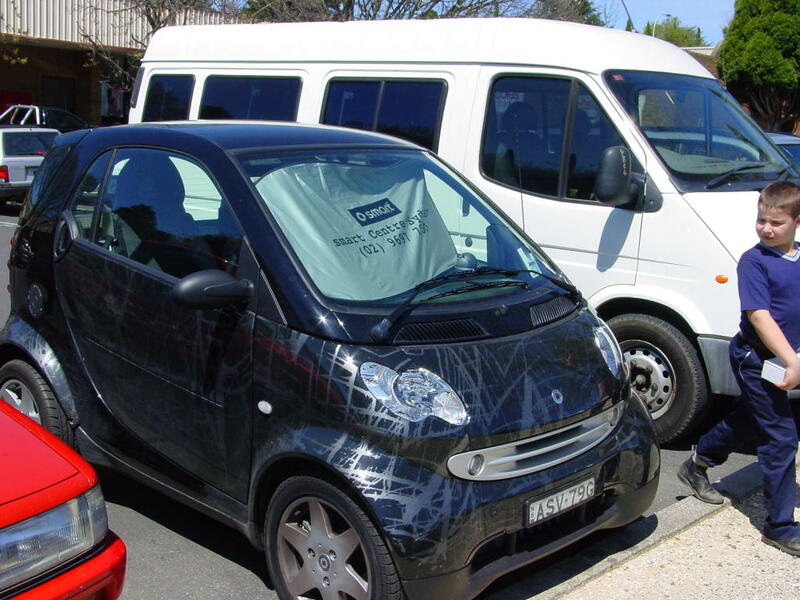 It was a "Smart Fortwo" car. With only two seats and 2.5m long we were all fascinated. As you can see in the photo James couldn't help staring at the car as he walked away. Our "little" car is in the background. Lana and the children have restarted their daily walks up to the local General Store/Post Office. The walk combines getting the mail, catching up on local news, going past the playground and nature walk. Yesterday the children noticed what looked like a leaf on the gate. It was actually a moth. 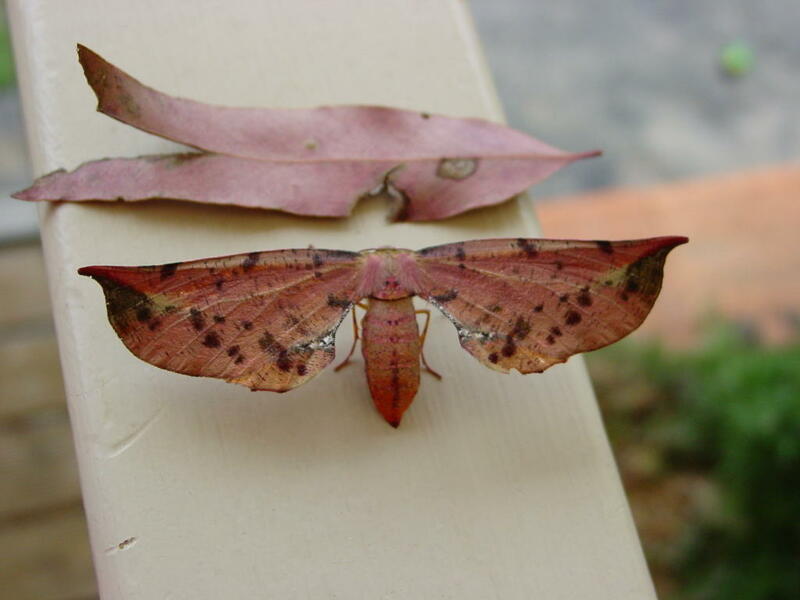 Our research indicates it is probably a Gum Leaf Skeletonizer Moth. Click on the picture for a close up and compare it to the dead gum leaf in the background. How is that for camouflage? Underneath the moth is bright yellow/orange. The hand rails are about 90mm/3.5" wide which means the moth is about 10cm/4" across. 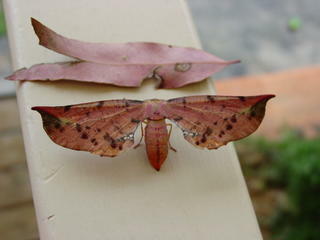 Its lower wings are folded under the upper ones. The caterpillars are hairy and can cause skin reactions and they eat the leaves of eucalyptus/gum trees leaving only skeletal remains. Hence the name! The majority of our furniture, equipment, kitchen stuff and whatever we didn't take to the US were all stored in a spare room. This week we have been unpacking and discovering many items we had forgotten we had and were glad we hadn't thrown out in our pre-move cleaning frenzy. One surprise we didn't expect to find was a mouse. 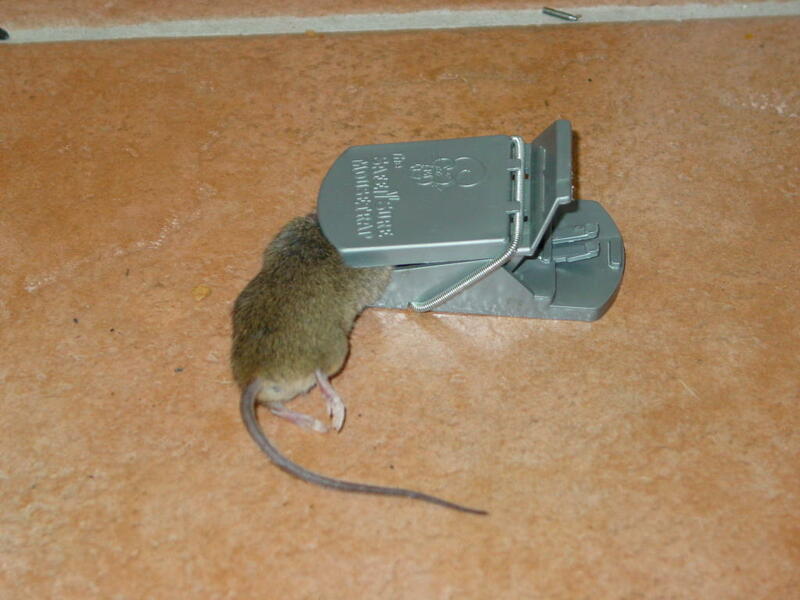 Lana's parents had set a trap in the spare room with no success once they noticed the mouse's calling cards. When we began unpacking some boxes in the house the mouse rushed out and scampered from hiding place to hiding place. The children had fun chasing him until he hid underneath the lounges. We knew he couldn't chew through the steel and solid walls, so we reset traps inside. By day two he had been caught. James wanted to keep him as a pet. Not - a - chance. The trap we used was a plastic one which works very well using peanut butter as bait. Unlike cheese which can be pinched/stolen without setting off the trap, when the mouse tries to lick or eat the peanut butter - SNAP! The sky is full of stars! We live about two hours south of the centre of Sydney and the sky here is very clear. Tonight I rediscovered one of the reasons we live here. The sky was FILLED with stars! With the naked eye you could see that the Milky Way was made up of millions of dots of light. When we first moved here I realised that God's promise to Abraham (to have descendants numbered like the stars in the sky) was for a lot more than the few one sees through the background light of the city streets. Of course this also means that it is quite dark at night. On our first night home we stumbled around barely familiar corridors looking for the bathroom. Nightlights were one of the early essentials. It's now been almost a week and we are pretty well settled in. I have started back helping out my clients, all our bags and boxes are unpacked, Lana's Cross stitch patterns are on the walls, we have food in the pantry and are getting back into a normal sleep pattern. The trick to avoiding jet lag (or at least minimising its effects) is NOT to go to sleep until it is dark. This meant staying awake from the time we landed at 6:00 am local time to around 6:00pm. So the children stayed awake 48 hours less about 6 hours on the plane. The younger ones fell asleep at various times during the journey, but the older ones did pretty well. We have all been getting to bed early and waking early too. Lana's mission yesterday was to get her pictures up on the walls. Once they are up we know we are home. Lana and her Mum worked out where they were all to be placed and then Lana's Dad came in to do the deed. He very wisely did other things until the girls had made up their minds! 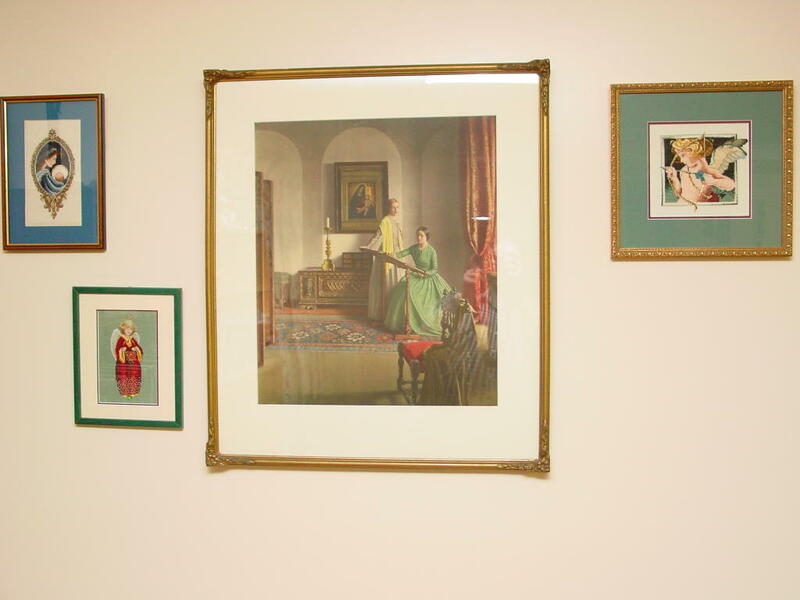 This photo is from the loungeroom showing an old picture we picked up from Vinnies (St Vincent de Paul Op Shop/Thrift store) and reframed surrounded by some of Lana's Cross stitch works. 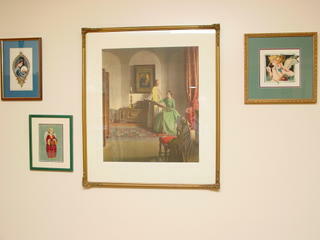 The picture is of two ladies doing some tapestry or cross stitch with a Madonna and child painting in the background. I like to take a couple of the children with me whilst out on errands. It keeps me company, they enjoy the outing occasionally getting a treat and I get to enjoy their assistance at the various places I need to attend. Yesterday I had Clare and Ariel with me and we were listening to the story teller Jim Weiss. He is a very good narrator using many voices and has a large collection of stories on CD. As he was telling us some famous fairy tales I asked Clare, "Do you know this story?" "I don't know." Clare replied in an equally confident voice. After listening to "The Shoemaker and the Elves", we then heard the story of "Rapunzel". When the witch took away the one year old Rapunzel, Clare announced that the elves should sneak in to the witch's house and take the baby back. I had to explain they were still busy making shoes and weren't available. Clare is obviously learning problem solving and learning to apply this skill as required. Ariel and Eric have a mission. 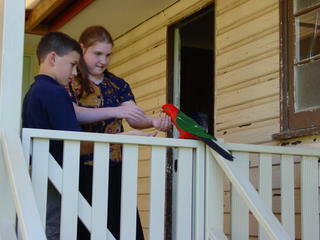 They are trying to get close enough to the King parrots to feed and pat them. Ariel and Eric have them feeding from their hands, and they are getting very close to allow themselves to be patted. The parrots preferred feed is sunflower seeds. 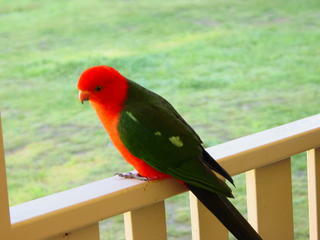 This little fellow is one of a number of Australian King Parrots that visit us each morning. They have gotten used to the availability of seed our friends had supplied whilst we were away. So as part of our shopping I included bird seed. We will make a bird feeder a little ways out from the back deck so that all the deck remains cleaner and we should all have a good view of these colourful Australian native birds. There is a great tool to help you determine the type of bird at which you are looking called "The Bird Finder". It works very well! Once found there is an information page which includes the bird call and other useful information.